tinea capitus - WELCOME TO ERS 4 KIDS !! 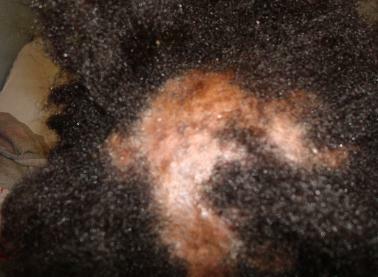 Tinea capitis is a disease caused by superficial fungal infection of the scalp, eyebrows, and eyelashes, with a propensity for attacking hair shafts and follicles. The disease is considered to be a form of superficial mycosis or dermatophytosis. Tinea capitis is caused by fungi of species of genera Trichophyton and Microsporum. Tinea capitis is the most common pediatric dermatophyte infection worldwide. The age predilection is believed to result from the presence of Pityrosporum orbiculare (Pityrosporum ovale), which is part of normal flora, and from the fungistatic properties of fatty acids of short and medium chains in postpubertal sebum. Laboratory diagnosis of tinea capitus depends on examination and culture of skin rubbings, skin scrapings, or hair pluckings (epilated hair) from lesions. Griseofulvin has been the treatment of choice in all ringworm infections of the scalp. Most specialists recommend a griseofulvin dosage of 20-25 mg/kg/d for 6-8 weeks. Griseofulvin accumulates in keratin of the horny layer, hair, and nails, rendering them resistant to invasion by the fungus. Treatment must continue long enough for infected keratin to be replaced by resistant keratin, usually 4-6 weeks.